FRAMINGHAM, Mass.--(BUSINESS WIRE)--An organization's processes, assets, and even products have become a living ecosystem of communication, cognition, and collaboration due to the increasing connectedness of everything. 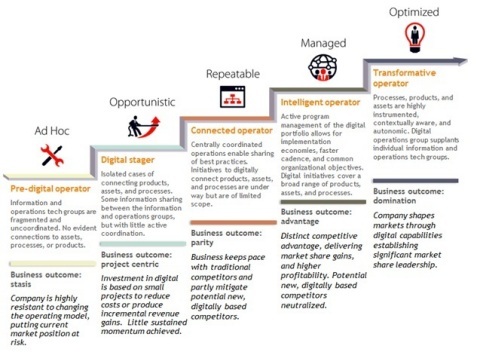 To compete in the intelligent markets, it is essential that an organization's operating models are transformed, according to a new report, IDC MaturityScape: Operating Model Digital Transformation (Doc #255779), from International Data Corporation (IDC). Operating Model Digital Transformation (DX) is the ability to make business operations more responsive and effective by leveraging digitally connected products/services, assets, people, and trading partners. This study identifies the stages, dimensions, outcomes, and actions required for business executives to integrate digital business technologies into their future operating models. Collectively, these areas come together to reshape how a company fundamentally operates in an intelligent economy and successfully completes its digital transformation. The ultimate business outcome is a company that shapes markets through digital capabilities and establishes significant market share leadership. In addition, the new framework outlines five stages of maturity: ad hoc, opportunistic, repeatable, managed, and optimized. Maturity in Operating Model DX enables the enterprise to spend more of its time and energy focused on developing new products and services by integrating the business' external digital connections to its markets and suppliers with the internal digital processes and projects that are directly impacted by customer requirements. Operating Model DX defines "how" work gets accomplished in terms of digital transformation. Leaders must take a hard look at themselves and their teams and assess whether they have the "right stuff" to hone and synthesize all the ingredients of digital transformation. IDC believes that many organizations will attempt to transform through a series of initiatives targeting specific digital competencies while losing sight of the interplay and synergies that are needed for true operating model DX. Meanwhile, not all organizations will prioritize attention in the same way. Retail and financial services will likely focus first on connected products/services, along with manufacturers and utilities. Connected assets will get a first look from service firms offering maintenance or smart building technology, as well as manufacturing and energy. Organizations that master the orchestration of the five disciplines will thrive; those that don't will struggle to survive. "While operating model transformation is one of the five elements of overall digital transformation, it may be the most foundational for continued success and the most difficult to realize given the long-established practices in many industries," said Robert Parker, group vice president and general manager of IDC Retail, Energy, and Manufacturing Insights. "This study will help organizations understand where they are in transforming their operating model and what they have to do to realize the benefits of DX." IDC's Omni-Experience MaturityScape is part of a new series of Digital Transformation (DX) MaturityScapes, across five key dimensions: Leadership DX, Omni-Experience DX, WorkSource DX, Operating Model DX, and Information DX. To learn more, please visit http://bit.ly/1AwAYyg. For additional information about this report or to arrange a one-on-one briefing with Robert Parker, please contact Sarah Murray at 781-378-2674 or sarah@attunecommunications.com. Reports are available to qualified members of the media. For information on purchasing reports, contact insights@idc.com; reporters should email sarah@attunecommunications.com. IDC MaturityScape reports are used by IT executives and their enterprise partners to have a structured way to identify their current level of maturity, and the gap between where they are and where they want to be to maintain competitive balance or achieve industry superiority. Using IDC MaturityScapes is a way to reduce the friction of change, to make more precise investments, and to identify the details of governance, process, technology, organization, and other factors that can derail the best-laid technology initiative. This IDC MaturityScape identifies the stages, dimensions, outcomes, and actions required for business executives to integrate digital business technologies into their future operating models.